Indraprastha Apollo Hospital is a world renowned multi-specialty tertiary care hospital, which was established in 1996. The 695 bedded, state-of-art facility is outfitted with the most modern technology operated by highly trained professionals across all its 52 specialties and provides world class medical care to all the patients, domestic or foreign. Indraprastha Apollo Hospital, New Delhi, houses highly accomplished and experienced doctors across all the specialties, and especially in Cardiology and Neurology, who are dedicated towards providing best medical treatment to their patients. Being a highly accredited hospital in India, Indraprastha Apollo has developed its own system called The Apollo Standards of Clinical Care (TASCC) to maintain premium standards of quality clinical care to all the patients. The Apollo Transplant Program made an accomplishment by performing 1627 transplants (410 Liver and 1210 Kidney) out of which the Transplant Program in Delhi performed 979 transplants (289 Liver and 690 Kidney). The hospital has won many national and international accolades, and continues to be one of the top healthcare service providers in India. 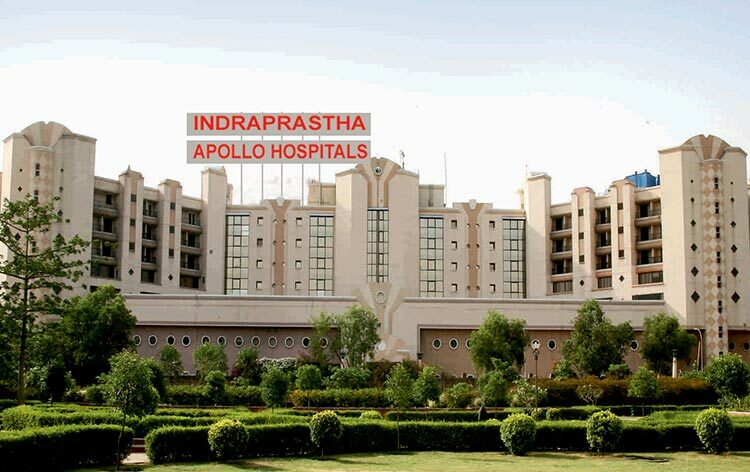 Indraprastha Apollo Hospital is well equipped with next-generation medical technologies like PET-MR, PET-CT, Da Vinci Robotic Surgery System, BrainLab Navigation System, Portable CT Scanner, Novalis Tx, Tilting MRI, Cobalt based HDR Brachytherapy, DSA Lab, Hyperbaric Chamber, Fibroscan, Endosonography, 3 Tesla MRI, 128 Slice CT scanner and many more. Latest equipments like modern patient monitoring systems are set up in Intensive Care Units (ICUs) and Operation Theatre, to ensure optimum patient care. First Hospital in India to be Internationally Accredited by Joint Commission International (JCI) consecutively for the fourth time. Successfully performs a Split Liver Transplant in two adults, which is a first in the city and second in the country. One of the largest Dialysis Units in India. 6 bed dedicated Bone Marrow Transplant Unit with stringent infection control practices. Indraprastha Apollo Hospital is a world-class hospital, which for years has been providing exceptional service to international patients. The hospital has a particular International Patient Care team which caters to the needs and comforts of the patients travelling from abroad for getting treated in India. There is a separate International Patient Lounge which addresses various issues pertaining to the Visa, accommodation, treatment plan and packages etc. Nearest Railway Station: New Delhi Railway Station which is around 16 Km away from the hospital and it takes about 19 min to reach the hospital. Nearest Metro Station: Jasola Apollo Metro Station which is around 50 meters away from the hospital and it takes only 1 min walk to reach the hospital. Indraprastha Apollo Hospitals performs 407 different procedures. Click on a procedure name to see more details and to view doctors for that specialty. 4.2 average based on 60 reviews.